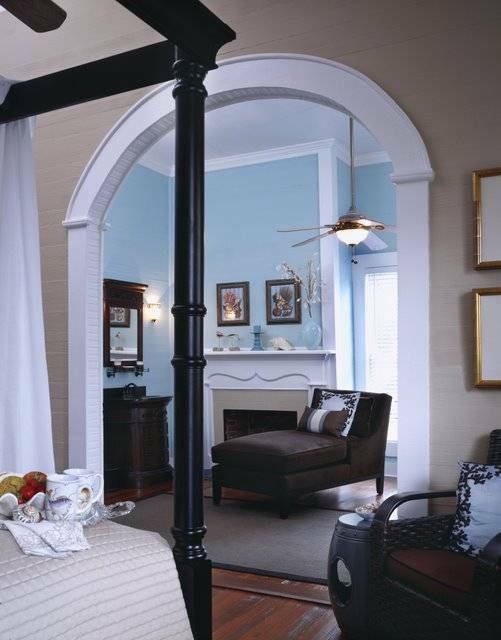 A luxurious Bed and Breakfast Inn consisting of three elegant historic homes, in a quaint unique town. 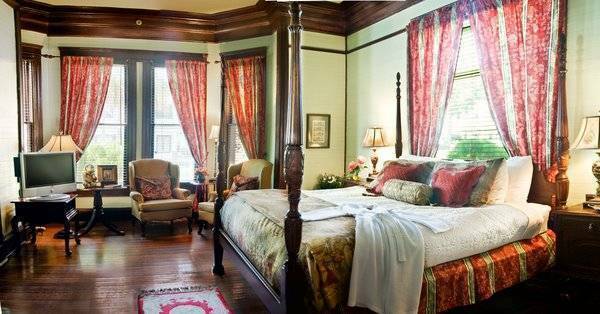 All 23 rooms have private baths, free wi-fi, cable tv, phone, coffee, antiques, & free bikes. 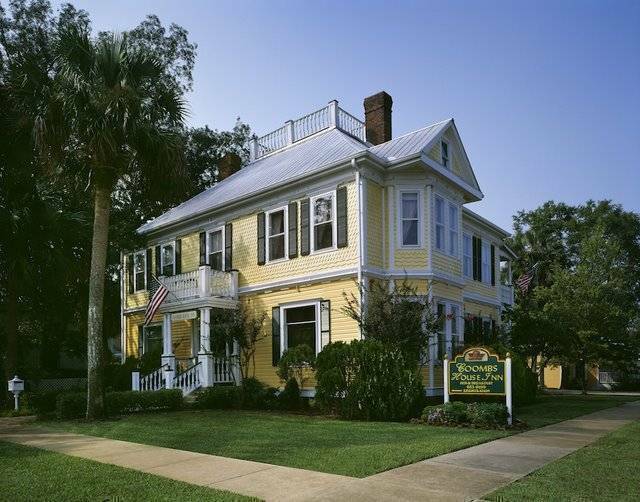 The Coombs House Inn is a luxurious Florida Bed and Breakfast consisting of three elegant Historic Victorian Mansions located between Pensacola and Tampa on the unspoiled Gulf Coast known as "Florida's Forgotten Coast." Since 1994, visitors have returned to our relaxing, romantic accommodations for a quiet alternative to typical Florida hotels. Less than 2 hours from Panama City Beach and Tallahassee, the historic, picturesque seaside village of Apalachicola is adjacent to the pristine white beaches of St. George Island, near Cape San Blas of Mexico Beach and WindMark Beach in Port St. Joe. Walk or bike to nearby boutique shops, museums, art galleries, and waterfront cafe's serving fresh local seafood and famous Apalachicola oysters served 28 different ways. 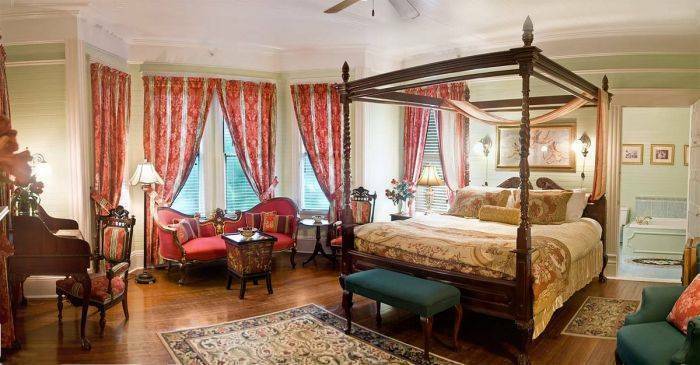 Tour our 4-star guest suites furnished with European antiques, four poster beds, original oil paintings and oriental carpets on gleaming hardwood floors. All 23 rooms have private baths (7 with romantic whirlpool massage spas), complimentary Wi-Fi internet, in-room Starbucks coffee and flat screen cable TVs. 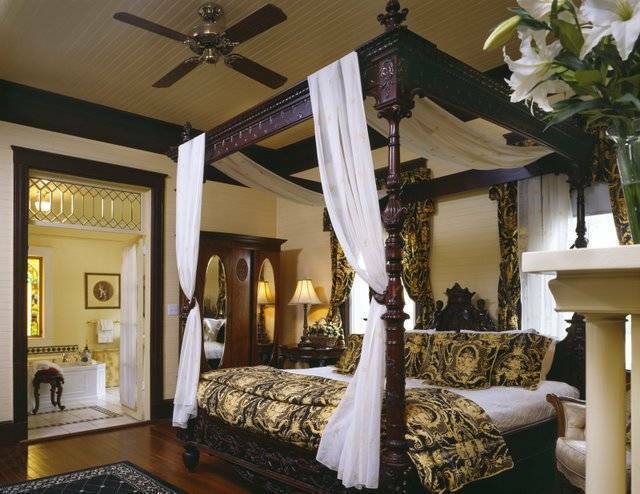 Several 2 to 3 room suites are available, some with kitchenettes and private verandas, perfect for family vacations, bridal wedding parties, girl's getaways and pets. From complimentary gourmet breakfasts to afternoon teas and evening wine tastings, view our complete list of amenities and learn more about our unique area. Massage whirlpools: rooms Eight, Eleven, Seventeen, Twenty, Astoria, Biltmore, and Cloister. Refrigerators: rooms Eight, Eleven, Seventeen, Twenty, Astoria, Biltmore, Cloister, and Dupont. Private verandas: Astoria, Biltmore, Cloister, and Dupont. Private door to Mansion veranda: rooms 4, 7, and 9. Physical disability particular rooms: 4 & 14. Other rooms are physical disability accessible, including a ramp and parking. We would be pleased to make special arrangements for garden and beach weddings, meetings, receptions, family reunions, groups, and holiday parties. The coastal communities of Apalachicola, St. George Island and Eastpoint, the heart of the Forgotten Coast, offer an authentic taste of Florida's Gulf Coast. Experience historic Apalachicola, a quaint small southern town with a strong maritime culture, an eclectic group of locally owned shops and galleries, restaurants which serve fresh local seafood, and meticulously restored B & B’s and hotels. You’ll also find miles of uncrowded pristine beaches, an endless supply of shallow bays and waterways, excellent fishing and acres of National and State forests to explore. Combine all this with some of the finest oysters and seafood in the country and your stay with us is sure to be perfect! Coombs House Inn is an exclusive property where every guest reservation is both important and special to us. If your travel plans change and you must cancel your reservation, please call us at least 48 hours for weekday stays, and 7 days for weekend stays, prior to your arrival date to cancel your reservation (less a $50 processing fee). In the event that you must cancel with less notice, shorten your stay or check out early, please understand that we must ask you to take responsibility for your entire reservation. If we can rebook your room(s), a full or partial refund may be made. Rates/policies are subject to change and vary during high impact periods and special requests. A 30 day cancellation notice is required on whole house bookings and for some holidays, special events and weddings. Sales tax is 7%, plus an additional 2% for rooms. Rates are based on double occupancy, $25 per additional guest. Florida Seafood Festival (first weekend of November) $30 extra per night. Children under 12 stay free. We have a few roll away beds ($25) that fit in some rooms, please call us for availability. Check-in: 3:00 PM - 10:00 PM. If arriving outside of check-in times, please call to make arrangements. Check-out: 11:00 AM. No Smoking inside; however, designated outdoor smoking areas are available. Pet Policy: Coombs House Inn is pet friendly. $25 per pet fee. Must be clean, quiet, under 25 pounds, and not left alone in room. Subject to prior approval, call for details. By reserving with us, you consent to these policies. 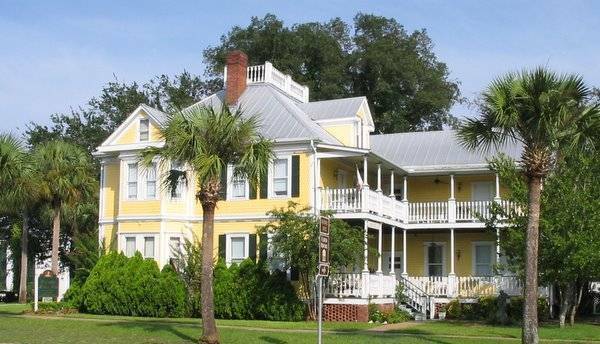 The Coombs House Inn is located in Apalachicola, at the corner of US98 (Ave E) and 6 Street, just 70 miles southwest of Tallahassee and 60 miles southeast of Panama City, Florida. Come to the Main House to check in (not the East House on US98 and 5 Street). From the West: Take US98 to Apalachicola. After you first start to see houses of town, we are 2 miles more. Pass the Piggly Wiggly & CVS at 11 Street, & we are 5 short blocks more, on the right. From the East: Take US98 thru Eastpoint, go across the Bay on Gorrie Bridge, 5 miles to Apalachicola. Go thru town, turn left at the flashing yellow light (staying on US 98 (Ave E)) & we are 3 short blocks more on the left.